In Oregon, more than 140,000 non-industrial “small” forest landowners care for almost 4.7 million acres of forestland. These private landowners comprise about one-third of Oregon’s private forestland, or about 15% of Oregon’s total forestland. In 2011, the statewide timber harvest from small forests was 228 million board feet, or 7% of total statewide timber harvest. Historically, these small forests annually provide from 6% to 15% of all timber harvest statewide. The small, non-industrial forest category is typically family-owned, and it includes private ownerships from 2 acres to 5,000 acres in size—averaging in the 20-80 acre range. These small forests are commonly referred to as: family forests, non-industrial private forests (NIPF), woodlands, woodlots, farm-forests, ranch-timberlands, or tree farms. Small forest landowners are proud of their well-tended forests, for the aesthetics, recreation habitat, water, and timber income their forests provide. Small is a good thing across the Oregon forest landscape, because the variety of landowner objectives and management strategies—small & large, private & public—create tremendous biological diversity throughout Oregon’s 30 million acres of forestlands. The small forestlands contribute invaluable richness to the mosaic pattern of private and public forests across the state. Every landowner has their own vision for maintaining their land over time, but not everyone is sure how to make their vision a reality. Are you interested in taking care of your forest? Do you want to be a good steward, but are not sure where to start? Being a small forestland owner in Oregon can bring many rewards. It may also lead to many complex questions and a need to learn more. Whether you own a small forest, or are just interested in learning more about Oregon’s forests, continue reading to find information that can help you manage your forest or simply to better appreciate Oregon’s special small forestlands. How to Choose a Logger—Picking a professional logging operator (logger or contractor) is one of the most important steps taken when harvesting a forest, selling timber and completing tree planting. Landowner may want to receive quotes from more than one logger, before choosing the right contractor for the job. Work with a Forester— Many forest landowners enlist the services of a consulting forester to help manage complex forestry operations —because an owner may not be familiar with the details concerning: logging methods for selling timber; forest roading; timber accountability; Oregon forest regulations; forest management; reforestation challenges; contracts; or market prices. Develop a Management Plan—A forest management plan should include small forest landowner’s long-term goals for ownership, investment, timber growth, harvest, reforestation, resource benefits, protection, and income—and ways to attain those goals. Small forest owners with questions about managing their forestland should contact a forestry professional to develop a long-term forest plan—before conducting a timber sale. Written Contract— It’s prudent business practice to communicate in a written agreement, the planned forest harvest, reforestation and other operations prior to beginning a timber sale project. A written contract is very important to describe the responsibilities of each party to conduct a forest operation. By putting all agreement details in writing, a contract protects all parties: forest landowner, logging contractor, and timber purchaser (mill). The logger rarely takes title to timber/logs. Standing timber is real estate until it is cut. Boundaries & Legal Restrictions—Prior to any operation, all legal matters and location of the forest property, deed and harvest area must be determined, described in writing, mapped and marked on-the-ground, including: surveyed & posted property lines, clear title to timber, and no mortgage or easement restrictions. Harvest/Reforestation Prescription —Designating which trees to cut, or left to grow, should be tailored to the site, visibly-marked, and based on a forest management plan. The harvest area boundaries and methods to fall trees, and skid from stump-to-road should be stated. Harvest methods are closely-linked to the terrain, roads, water & habitat, leave tree protection, fire hazard, slash disposal, reforestation, and management plan. Logging/Transportation Plans—Carefully-planned forest roads are a valuable investment necessary to harvest, reforest and manage a forest. Log truck hauling and road use methods should also be agreed upon. After harvest and planting is completed, necessary road repairs and management remains important to protect the landowner’s forestry investment. Timber Appraisal & Scale—It’s necessary to have the timber appraised prior to harvest, and scaled/measured after harvest by a knowledgeable forester—to assure that the timber value is accurately measured (“scaled”) for payment terms. Payment terms should be stated in the contract. It’s common for the log-purchasing mill to agree to make two monthly payments for logs delivered to/purchased by the mill: 1) share agreed to the landowner; and 2) shared agreed to the logger. Post-Logging Clean-up— After harvest is completed, the small forest owner should specify the agreed-upon final conditions for which to leave the harvest area, including: necessary clean-up, logging slash, reforestation, forest roads & ditches, stream crossings, burning, erosion control, fence repair, or other special needs. Planting after Harvest Required—Oregon law requires a landowner to assure successful reforestation after harvest to keep forestland productive and sustainable. Seedlings must be planted by two years after logging, and within four years after planting, the law requires at least minimum number of young tree seedlings per acre to be well-distributed, healthy and “free to grow”. Legal Requirements for Harvesting—Forest operations in Oregon are regulated to assure environmental protection, fire prevention, burn management, and tax payment. Prior to beginning commercial forestry operation, the landowner or operator must file a detailed Notification Form, Power-Driven Machinery Permit, and a Burn Permit, with a local office of Oregon Department of Forestry (ODF). ODF Stewardship Foresters may monitor operations to assure compliance with the many regulations. Consulting Forester reputation?—How long in business? List of references from landowners and timber mills? Whether a small forest owner is dealing directly or indirectly with a log buyer, timber purchaser, logging contractor, or consulting forester, you should always request references, experience, applicable credentials, and certifications. Possible forester credentials may include: Association of Consulting Foresters (ACF); Certified Forester (CF); and/or Oregon Professional Logger (OPL). Contractor reputation?—How long in business? List of references from landowners and timber mills? When a small forest owner hires a forest contractor to complete any number of forest management services—forest management plan, harvest plan, logging, roads, reforestation, or other—the forest landowner should always request references, experience, applicable credentials, and certifications. Possible contractor credentials may include: Oregon Professional Logger (OPL); Construction Contractors Board License (CCB); Certified Forester (CF), and/or Association of Consulting Foresters (ACF). Estimate of rates?—Early in the consideration, can the contractor provide a quote for prices and payment methods? Details might include unit of timber volume, measurement methods, cost of logging service/forestry work, payment terms, and income from timber harvest job. Once the contractor is chosen, can rates and payment terms be written in a contract? It is common for scaled-sale harvesting contracts to specify that the log purchasing mill(s) to separately pay the logging contractor and the land/timber owner in two separate checks—each receiving their agreed-upon share of the proceeds. Written contract agreement and map?—Written contract & map to address agreements for work conduct, work plans, measurement, payment, prices, completion, timing, liability, taxes, regulations, and dispute resolution. Legal description, title to property-timber-road?—Forest landowner must be able to verify location, legal description, county tax lot, title to the property and harvest area; property boundaries near harvest are surveyed & posted; private road easement legal description, if applicable. Site visit and locations?—Conduct on-site visit to agree upon, write, and map the locations and specific terms for planned forestry operations. Insured?—Certificates to verify proof of coverage by both workers compensation insurance (employees & owners) and forest liability insurance (loggers broadform). Some contractors may also carry a construction contractors license and bond (CCB). Forest goals planned?—Forest management plan, which describes management goals and contracts, harvest, roads, reforestation, resource protection, fire prevention, scheduling, and so forth? Logging plan?—Harvesting plan should describe and locate on-the-ground the logging method, harvest system, cut/leave tree marking, tree selection methods, leave tree objective, timber falling, skidding pattern, site protection, equipment and utilization. Roading plan?—Forest access plan, which describes and locates on-the-ground all road locations, log landings, gates & legal easement access, road drainage & culverts, road use conditions, and road maintenance standards? Reforestation plan?—Completing successful reforestation after clearcut harvesting is the legal responsibility of the landowner, as required by Oregon Forest Practices Act & Rules. Normally, the important jobs of site preparation, planting, release, and tree seedling protection after planting must be planned at the time of harvest. By Oregon law, a young stand of seedlings must be planted within 2-years after harvest, and a number of well-distributed healthy seedlings must be “free-to-grow” by 6 years after harvest. Area clean-up?—Post-operation clean-up plans should describe satisfactory on-the-ground work for slash piling, debris burning, erosion control, grass seeding, waste removal, road re-shaping, road maintenance, work locations, and so forth. Sub-contracting terms?—If the contractor hired sub-contractors, how would you ensure that those sub-contractors also completed quality work? Those sub-contractors should be held to the same insurance and performance standards. Every small landowner should consider goals and objectives for owning and tending their forest land. Oregon forests are complex, they change over time, and making sure your forest meets your goals and conditions usually will require periodic forest management. Planning is the foundation of good forest stewardship and management. Good small forestland management in Oregon relies on a few key concepts: management plans; forest professionals; harvesting; planting; forest regulations; and taxes. Management Plans. Forest management decisions have long-term consequences. A written plan formally develops a course of action to achieve small forest property goals. A forest management plan outlines your family’s vision for your forest, describes the current forest condition, and outlines a plan of action to achieve your management goals. A forest management plan encompasses all the resources on your property – trees, roads, streams, wetlands, wildlife habitat, recreational sites, and anything else that is relevant to your family and your goals. A plan can help you keep track of activities, communicate with family members and professionals, and earn green certification for your forest. Seek Help From Forest Professional. Relying on the expertise of a reputable forestry professional for help with management planning and timber sale reduces the likelihood that the inexperienced landowner would have problems harvesting and selling timber. When it comes time to harvest, having a well-thought out management plan makes the timber sale more effective. Although the timber harvest can be a source of great landowner satisfaction, it may also be fraught with surprises, frustration and stress—especially for small landowners who are unfamiliar with forestry and infrequently harvest trees. Many small forest landowners have found that when using a professional forestry consultant, and/or an experienced small forest logger, they in-fact had fewer problems, and better end-results during the harvest and sale of timber than those who did not. A University of Georgia study found that small landowners using a forestry consultant to assist with harvesting realized up to greater 50% greater profit. The advantages of using the services of professional help—consulting forester or professional logger—is that the professional can best access and contract with preferred markets, relationships with contractors, local experience, least-cost efficiencies, and log accountability. Income From Trees: Harvesting. There are many things to consider before selling and harvesting your timber. Typically, the purchaser of timber will either purchase standing trees from the landowner, or, a purchaser will simply buy the delivered logs at a timber mill. In the first situation, the purchaser completes the harvesting, while in the second case the landowner would be responsible for the harvesting and log trucking. The contracting, accounting, forestry, financial, and legal arrangements are different in each situation. Planting, growing, and harvesting trees is a rewarding vocation, but it gets very complicated unless knowledgeable and experienced forest professionals are sought to help in the process—especially when conducting a harvest operation. Reforestation/Planting. No forest harvest is complete until the newly-opened area is reforested (forest thinning usually does not require planting). Tree planting the right way ensures successful reforestation* after a regeneration or clearcut harvest. The Oregon Forest Practices Act requires successful reforestation within six years after harvest—which usually requires tree planting within two-years following clearcuts. In some forest situations, natural seeding does supplement the number planted trees; but, rarely can this natural regeneration accomplish the reforestation standard without significant early planting. Therefore, reforestation by planting tree seedlings is extremely important to plan before a regeneration harvest is begun. In Oregon, it is the small forest landowner’s legal responsibility to assure that successful* tree reforestation is completed after a regeneration harvest. Arranging to harvest and market your timber can be a complex process. Unfortunately, there is no single resource or publication that will make you an expert timber seller. There are many considerations when planning and conducting a timber sale—which we discussed in the 8-step basic list of timber selling considerations below. Hire a reputable professional to help plan and sell your timber. A consulting forester, a timber mill log buyer, or a logging contractor are examples of professionals who can help a small forest owner make a management plan and arrange a timber sale harvest operation. Relying on the expertise of a reputable forestry professional for help with management planning and timber sale reduces the likelihood that the inexperienced landowner would have problems harvesting and selling timber. When it comes time to harvest, having a well-thought out written forest management plan, and a written harvest contract, makes the timber sale more effective. Although the timber harvest can be a source of great landowner satisfaction, it may also be fraught with surprises, frustration and stress—especially for small landowners who are unfamiliar with forestry and infrequently harvest trees. Many small forest landowners have found that when using a professional forestry consultant, and/or an experienced small forest logger, they in-fact had fewer problems, and better end-results during the harvest and sale of timber than those who did not. A University of Georgia study found that small landowners using a forestry consultant to assist with harvesting realized up to greater 50% greater profit. 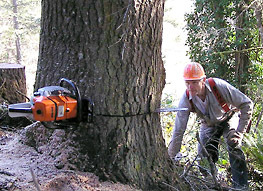 The advantages of employing the services of professional help—consulting forester or professional logger—is that the professional can best access and contract with preferred markets, relationships with contractors, local experience, least-cost efficiencies, and log accountability. Consulting Forester or Contractor reputation?—How long in business? List of references from landowners and timber mills? Whether a small forest owner is dealing directly or indirectly with a consulting forester, log buyer, timber purchaser, or logging/roading contractor, you should always request references, business experience, applicable credentials, and certifications from your primary contract manager. Possible credentials may include: Association of Consulting Foresters (ACF); Certified Forester (CF); Oregon Professional Logger (OPL); International Society of Arboriculture Certified Arborist (ISA); and/or Construction Contractors Board License (CCB). A timber sale is a serious matter requiring careful preparation. The results of many years of past timber growth are at stake, and the condition of the forest after the sale profoundly affects its productivity for many years to come. If profit is a primary objective, avoid the temptation to make a “quick sale.” Seek professional advice, think about what your plans, and don’t be pressured into making a hasty decision to sell without adequate preparation. Hiring a reputable consulting forester or professional logger simply to begin planning future forestry or harvest projects may be a sound investment. Next, be sure to clearly and thoroughly state all the important timber sale and project agreements in a written contract and map. Only then, after you are confident of your small forest plan and contract, would you be ready to embark on conducting a timber sale. It’s a sound investment for the small forest landowner to prepare a written forest plan that outlines the owner’s long-term goals and strategies for managing their forest property. A forest management plan should include small forest landowner’s long-term goals for ownership, investment, timber growth, harvest, reforestation, resource benefits, protection, and income—and ways to attain those goals. Properly-managed small forests—that follow a long-term plan—will produce a greater array of resource values important to the landowner than would an unmanaged forest. Well-planned forests yield more timber, have a higher net present value, suffer fewer destructive losses, see less environmental impact, and most importantly, provide richer abundance of values important to the landowner, such as: wildlife habitat, aesthetics, recreation uses, grazing forage, road & trail access, fire-pest-disease protection, invasive control, fisheries, water yield, and timber income. Forest management plans are also required for third-party certification, including the American Tree Farm System (ATFS), Sustainable Forestry Initiative (SFI), Forest Stewardship Council (FSC), and other possible future markets, such as woody biomass and carbon sequestration. The management plan is also required for small forest projects, where the landowner seeks federal or state grant funding assistance from the US Natural Resources Conservation Service (NRCS), or Oregon Dept. of Forestry (ODF). 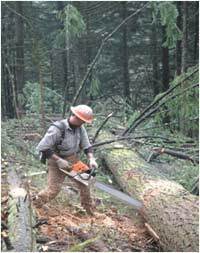 A timber sale is a serious matter requiring careful preparation by the small forest landowner. The results of many years of past timber growth are at stake, and the future forest condition after the sale profoundly affects its productivity for many years to come. Pre-harvest planning ensures that your small forest management goals and objectives are not compromised. It reduces opportunities for misunderstandings between the small forest landowner and the timber buyer and/or logger. And, harvest planning helps ensure that the logging operation will maximize financial returns for all parties, it will best protect the forest resources, and maintains or enhances future forest productivity. Pre-harvest considerations. Things to consider when selling a small forest landowner’s timber includes: the area to sale; volume of timber for sale; readiness of the forest for harvest; harvest may trigger reforestation needs; and the tax implications of conducting a timber sale (State harvest, State income, and Federal income taxes). The landowner needs to know what type of harvest, logging methods, and road access to be completed. The type/method/access of harvest should be based on the landowner’s forest management plan objectives, which might include maximizing the stand value, periodic cash flow, future tree growth, road improvement, fire hazard reduction, or improving the aesthetics of the stand. Planting. Reforestation alternatives should also be planned prior to the initiation of a timber harvest, to ensure that the specific harvest methods used will complement successful reforestation methods and long-term forest goals. Written plans. All of the proposed operations, and their boundaries, identified during pre-harvest planning should be written in a pre-harvest plan, which includes an accurate map of the timber sale area. Before harvesting begins, you or your forestry professional representative should conduct an on-the ground meeting with the buyer and logger to review the pre-harvest plan, and mapped locations of proposed operations. Map. The preparation and use of a reliable harvest area map is a valuable tool that identify harvest unit boundary, streams, wetlands, roads, property boundaries, steep grades, road access, and the proposed harvest methods. The use of the map also helps in planning the best time of year to harvest, and the potential location of roadside log landings, stream crossings, road culverts, and temporary roads. Areas adjacent to streams, wetlands and lakes must be clearly designated as Riparian Management Areas (RMA), where limited timber harvesting and operations are required by law. Ground marking. Clearly marking on-the-ground the harvest unit boundaries, and riparian (stream) management area boundaries will avoid unintended activities and ensure loggers don’t cut non-designated trees. Clearly mapped, posted and surveyed landowner property lines will assure that loggers don’t trespass onto a neighbors’ property. Log price expected. The price of logs delivered and purchased by timber mills typically change monthly, and may vary seasonally and by tract and timber characteristics. Tract characteristics that drive the value received by the landowner—net of logging, trucking, roading, reforestation costs—include the tract’s operability, topography and access. That is, tracts with durable rocked roads that can be logged in wet conditions often demand a premium. Tracts that are unusually difficult (more costly) to log due to poor access, steep terrain, or other factors, often bring lower value received by the landowner. Tracts located within close proximity to purchasing timber mills, and short haul distances, often receive a premium to the landowner. Timber characteristics that drive value received by the landowner include sawlog species, grade, volume per acre, and tree volume. High quality sawtimber, high volume per acre, or currently-sought log grades & species often receive a premium to the landowner. And to the extent that these characteristics are not present, the price quoted by purchasing timber mills—net of logging and other costs—would be lower. The Oregon Dept. of Forestry (ODF) collects and publishes quarterly an online listing of sawlog timber prices from 1972 until the present. Prices that are maintained by ODF for several log species, grades, within five Oregon regions. No pre-plan pitfalls. Potential consequences of not having a pre-harvest plan results in time and money spent later on resolving unintended problems caused by the operations. Other pitfalls of insufficient pre-harvest planning include unintended post-harvest problems, such as: damaged or missing leave-trees, misdirected harvest activities, forest regulation citations, degraded road conditions, excess acreage impacted by skidding, inadequate road repair or post-sale cleanup, extra reforestation costs, and problems with subsequent site preparation and tree planting. Timber is generally offered and sold by one of two methods: negotiation or sealed bid. The small forest landowner should seek the advice of a forestry professional to determine which method best achieves your harvesting objectives. Negotiated Sale, involves face-to-face bargaining between a small forest landowner (the seller) and the buyer (timber mill log buyer). The most common sale method, typically the forest landowner seeks a quote from one or more log buyers, who will quote an offer price per volume for each specific log species, grade, and log length. In Oregon, the timber volume measure is typically calculated by the thousand board foot sawlog Scribner (MBF); or on the other hand, volume is calculated for low-value logs by the ton weight scale. Timber volume is measured for each species and log grade (e.g. DF #2 sawlog; hemlock #3 sawlog; or hardwood pulplog). A price per MBF, or per ton, is negotiated for each species and log grade. Sometimes, for small forest volumes, the log buyer’s quote may combine all grades of a species into a single quote, called a “camp-run” price for that species. Each timber mill typically purchases only a limited range of log species and grades that it manufactures. Because in most localities, nearby there is often only a single or few purchasers of any particular log grade, the log buyer’s quote may not be followed by much negotiation opportunity. Timber mill quotes from mills located farther distant from the nearest mill buying a particular log grade, may be considered by the seller—although higher log trucking costs would have to be figured into the seller’s net income calculation for logs sold to the distant mills. Sealed Bid Sale, involves the small forest landowner (seller) seeking a confidential offer in-writing for the right to purchase the seller’s timber, received from one or more prospective timber mill buyers. In this less common sale method, the buyer would submit a single price quote per unit of volume to purchase the harvest area timber volume, all log species and grades. A written contract is essential and will reduce unwanted surprises for the small forest landowner timber seller, for the timber buyer, and for the logger. Preparing a contract encourages forethought and planning, which minimizes difficulties and ensures that the transaction agreement is communicated in writing to all parties. A contract helps assure that the forest landowner’s expectations are met. A contract is not a substitute for good faith and fair dealing between parties; it is a framework in which good faith and fair dealing operate in an orderly and effective manner. Typically, the timber purchaser, or harvest contractor can provide a pre-written contract, which is tailored to the particular harvest operation/timber sale. Timber sale contracts involve an agreement to provide harvest services, as well as to sell a volume of timber to agreed-upon mill purchaser(s). Regardless of whether the contract is written with a timber purchasing mill, or a logging contractor, the ownership of the timber remains with the small forest landowner until the logs are delivered, measured and paid for by the purchasing timber mill. The logger rarely takes title to the timber/logs; the logging contractor is a service provider. Timber is real estate until it is cut. When logs are received and payment made by the mill, only then does the mill take ownership of the logs from the forest landowner. In Oregon, timber purchasing mills will require a valid current Oregon Forest Practices Act Notification Number, for every truck load of logs bought by the mill. Parties: Identify the two parties to which the contract is binding, usually the small forest landowner, or the harvest contractor (or the timber purchasing mill). If the contract is between the landowner and a purchasing mill, it is helpful to indicate who will be the harvest/road contractor(s). Indicate who are the designated “representatives” for each party; individuals who have decision-making authority. Legal Description: State the exact location and legal description of the subject real property; including the legal description of the designated timber sale harvest area (unit). State the method of posting the ownership property boundaries on the ground—if near the harvest area. Legal Deed: Contract statement by the forest landowner verifying their legal title to the property, and the timber, as evidenced by a provided copy of the deed, title documents, and county tax lot information. Timber Description: State the exact method of marking to identify the harvest area (unit) boundaries, and other activity areas on the ground. Road Description: State the important locations and legal information about any required forest road construction (if applicable). Map: Contract should include a clear and accurate map having a scale, north direction and legend—which indicates property boundaries, easements, harvest unit boundaries, roads, planned roads, streams, protected attributes, and any other important contract locations. Certified Forest: Landowners having certified forestlands may include relevant certification numbers or documentation. The following are provisions to consider including in a timber sale contract. Be aware that the conditions-restrictions-terms placed on harvesting may influence the price prospective buyers would pay for a small forest landowner’s timber. Reasonable landowner expectations should be discussed before those negotiated terms are included in the contract. Payment by Scaled-Sale: The contract will specify the payment per unit for each species and log product, as well as timing of payments. The timber volume used for payment in a scaled-sale is measured after harvest and delivery to the purchasing timber mills. At the mill yard upon the arrival of each truckload, an independent third-party log “scaler” (a log measuring professional) measures and records the log volumes/ species/ grades; this volume is used for subsequent payment at the agreed-upon price to the seller and logger. The unit of log measure is agreed in advance. Payment is typically based on the scaled volume for each truck load measured by the “scaler” at the mill log yard. In Oregon, the timber volume measure is typically calculated by the thousand board foot sawlog Scribner (MBF); or on the other hand, volume is calculated for low-value logs by the ton weight scale. It is important that each truck load be accounted for separately, and that each truck load of logs generates its own unique accounting record for log volume, species, grade and value. The forest landowner should expect to receive an accounting record of each scaled load, which accompanies each periodic payment from the purchasing timber mill. A per-MBF (or per ton) price may be determined in advance, but the volume of timber to be harvested is typically just an estimate prior to harvest—actual volume is determined by the scale measurement at the mill log yard. Sorting logs into highest-value products is critical to maximizing profit. Sometimes before the timber sale, to predict what timber is being sold, a small forest landowner may choose to also complete a timber “cruise” (measure & record log volumes/species/grades) of the standing timber prior to harvest (an added expense). Payment by Lump-Sum Sale: A “lump-sum” timber sale is the outright sale of standing timber for a fixed dollar amount agreed upon in advance. The buyer would submit a single price quote for the total volume, to purchase the entire harvest area timber volume, all log species and grades. The sale price is not a function of the actual volume cut. If a small forest landowner sells timber on a lump-sum basis, they should specify payment in full at the time of contract execution; or if you are deferring payment, the exact date(s) of expected payments. In the lump-sum sale, the buyer takes title to the trees upon the initial contract and payment—before the logging begins. This method requires prior to harvest that both the landowner and the buyer to complete an accurate timber “cruise” (measure & record log volumes/species/grades) and value appraisal of the standing timber. Because of the added cost for the cruise and appraisal before the timber sale for buyer & seller, this selling method is uncommon; or, the method is utilized only for high-value timber tracts, in competitive markets, and where multiple perspective timber buyers. Contract Time Period: Timber harvest operations are typically completed within a period and completion date specified in the contract, such as within 3, 6, 12, or 18 months of contract signing. Provisions for interim schedules and term extension can be specified, but details and completion dates should be clearly defined. There is usually a cost to the buyer for an extension. Logging Start Work: Agree on when logging can begin, and landowner informed prior to the contractor moving onto the sale area. Changes to Land or Remaining Timber: Resulting from harvesting, a certain degree of aesthetic change should be expected by the small forest landowner. Visits to comparable harvested sites before contracting may be illustrative. The landowner may state resulting expectations in the contract, such as: no more than a maximum number of trees per acre having visible skidding damage; or the expected condition of roads after harvesting is complete. Access Restrictions: Specify any road use restrictions for ingress and egress to your property. Specify road use requirements in the contract. Partial Cutting: Define the method for marking, or selecting, cut and leave trees. Include a penalty for cutting or damaging designated leave trees. If the contract specifies a dollar value per merchantable tree volume for errant cutting of leave trees, infractions would be discouraged. The customary penalty for such damage is double or triple the rate. Removing Overstory Trees: Harvest removal of a canopy or overstory to allow growth od smaller understory trees also warrants contract language. If the contract specifies a dollar value per tree for errant damage to leave trees, or failure to cut the cut-trees, infractions would be discouraged. Harvest Type: Specify in the contract the scope and type of harvesting to be completed—such as clearcut, thinning, overstory removal, seed tree, or shelterwood. If the timber is marked with paint, describe the cut-tree and leave-tree marking methods. For partial cutting, define leave tree damage tolerance. If it is an operator-select harvest, specify in clear language the tree selection guidelines for how cut-tree and leave-trees are selected by the operator. Contract should state any additional special harvest provisions that significantly affect the scope of the harvesting. Logging Slash: Specify in the contract the type and terms of any required treatment of logging debris—“slash” tree tops, limbs, chunks. As with harvesting, the designs and results for slash piling, and burning should be clearly stated. A slash treatment completion schedule should be indicated after the planned harvest. Slash distribution within the harvest area should be considered before harvest, as slash concentrations may affect tree planting and other reforestation activities that follow harvest. Forest Roads: Specify in the contract the type and terms of any forest road construction to be completed. As with harvesting, the designs and results should be clearly stated. Road completion schedule should precede the planned harvest. Reforestation Responsibility: Specify in the contract who is responsible to complete required reforestation after the timber harvest. Stating this in the contract removes any doubt about expectations. In Oregon, it is the landowner’s legal responsibility to assure that reforestation successfully occurs after harvesting that opens the forest below a specified minimum density. As with harvesting, the designs and results should be clearly stated. Tree planting completion schedule should be included, if the contract requires this task. Tax Responsibility: Specify in the contract who is responsible to pay required timber harvest tax, based on the harvest volume. In Oregon, it is the landowner’s legal responsibility to pay the required harvest tax. Stating this in the contract removes any doubt about expectations. Insurance: Specify in the contract that the contractor’s business, including and subcontractors, must carry contract-specified amounts of forest broadform liability insurance. Furthermore, the contract should state that the contractor’s business carry Oregon workers compensation insurance on employees and owners who work on the forest landowner’s property. It is customary for timber contracts to require contractors provide the landowner with current proof of insurance certificates, prior to work start-up. Follow Laws and Regulations: Specify in the contract that all forest operations should adhere to applicable Oregon laws and rules, especially Oregon’s forest practices, fire protection, burning regulations. Specify who is responsible to file the required Notification of operations (and Burn Permit, if applicable) with the Oregon Dept. of Forestry. Logging Systems: The contract may specify a certain logging system be used for different portions of the harvest area. To minimize damage to the residual stand of leave trees during thinning, special methods may be specified. Systems include cable yarding, shovel logging, skidding, cut-to-length, and so forth. Skidding & Yarding: Specific needs or expectations for tree ground-skidding, or cable yarding, should be indicated in the contract. Examples of special provisions might include: partial log suspension, directional felling away from a protected site, slash piling locations, landing locations, skid trail disturbance limits, skid trail pattern, and other logging standards. Address your expectations for repair of fences or other special places that may be damaged during harvesting. Timber Utilization: Specific log product recovery specifications should be indicated in the contract. Minimum log size and/or value to be skidded is often agreed upon in the contract. Minimum log size to be delivered to mills may also be stated. The landowner may consider provisions for tolerance for merchantable logs errantly left on the ground after harvest is completed. Road Maintenance: If roads are to be maintained to a minimum standard, refer to that standard in the contract. A typical requirement is to “return roads to as good or better condition than before logging occurred.” Address expectations for road use and maintenance during and upon completion of the harvesting. Special Landowner Provisions: Because the harvest operation is important to the small forest landowner, the contract should include any additional special measures unique to the landowner’s property and their expected harvest outcomes. Small ownerships have additional challenges often absent in large industrial operations; so the landowner should be clear about how the purchaser/contractor should deal with unique situations, such as: fencing; well-house; power-lines; stump heights; leave trees; landscaping; neighbor’s values; driveway; sheds/buildings; ponds; irrigation ditches; buried utilities; trails; special trees, and so forth. Cleanup: Post-operation results should be specified in the contract. Items a landowner may want to address include: trash removal; slash piling treatment; skid trail smoothing, road blading & shaping; ditch cleanout & shaping; water bars in trails or roads; grass seed & mulch landings; gravel addition to a road segment; cull logs piled for landowner firewood use; and others. Other Possible Contract Provisions: Timber loss-destroyed-stolen provision; provision for or against contract assignment; dispute resolution provision; termination provision; notarization of the contract; performance bond or deposit from buyer and held by a third-party. Pre-Work Meet Before Start: Arrange a pre-work meeting with the buyer, consultant and/or logger, so that the small forest landowner or their representative can all communicate together about proposed operations and the locations of critical activities. Often, the Oregon Dept. of Forestry Stewardship Forester is invited to this meeting. Meet in the field and walk the sale site to ensure harvest area boundaries, roads, landings, streams, buffers, and other special restrictions are understood. Communication During Operation: Check the logging operation on a regular basis and communicate frequently with the purchaser’s designated representative; document agreements and changes. Frequent two-way communication is the best tool to avoid misunderstandings and malfunctions with the operations; adjustments can be agreed along the way. Results Reasonable: The small forest landowner should be reasonable about expectations and assignment of damage penalties. Consideration of allowing for tolerance from expected outcomes is a reasonable consideration. The amount that you receive for your timber could be reduced due to excessive restrictions. The small forest landowner or their agent should frequently inspect the harvesting operation to ensure the contract terms are being fulfilled. Check logging operation progress, compared to contract provisions, on a regular basis to ensure that the specified contract requirements are accomplished, or need adjustment. The small forest landowner or their agent should ensure that the operation remains in compliance with applicable Oregon laws and rules— especially Oregon’s forest practices, fire protection, burning and worker safety regulations. For scaled sales, a log truck load accounting statement of what was removed during the harvest should be provided by the buyer to the landowner. The forest landowner can designate how frequently information is provided: weekly, monthly or at the end of the sale. If the “buyer” is the logging contractor, a load accounting statement would be provided by both the contractor and the purchasing timber mill. The load accounting statement record-keeping on scaled sales may include: truck load number; county & state; landowner’s name; date & time; scale ticket number; mill destination; logger; purchaser; log species & grade; gross load volume (or weight); and net load volume (or weight). The forest landowner should review all completed contract operations, and determine whether harvest contract provisions are complete. For any differences between the buyer’s and landowner’s interpretation of “completion,” both should negotiate and agree on remaining follow-up actions and timing limits, to address any further harvest operation remedial actions. Landowner and buyer to address any other issues related to non-compliance of the contract. A written notice of completion of harvest operations from the buyer to the small forest landowner can be helpful, confirming that the buyer considers their complete fulfillment of the harvest contract provisions. Additionally, the landowner should provide a written notice of completion of harvest operations to the buyer, once all provisions are completed to the landowner’s satisfaction. If a performance bond was required by the landowner, the bond would be released once all contract terms are met.